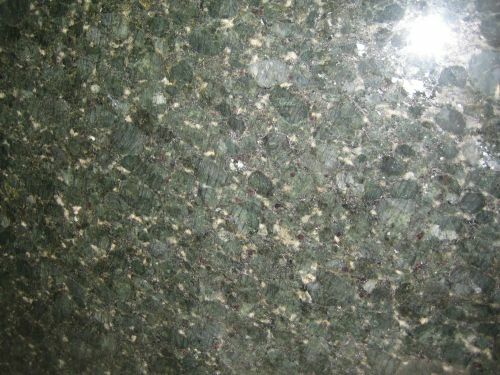 Verde Butterfly granite is quarried in Brazil. Green is the primary color of this stone. It has a unique blend of greens, greys, and white mineral deposits. Within in the stone itself you will also see black veining throughout the slab. The overall appearance is of a dark green with very low variations. Verde Butterfly granite has a unique dark green color that enhances the look and feel of countertops. This distinctive color gives the illusion of a larger and more spacious kitchen area. It’s very beautiful and gives you the feel of the outdoors. Verde Butterfly granite countertops look best when combined with natural wood stained cabinets. The earthy tones will blend well with the stained wood. When this is combined the dark black of the stone along with the sparkling quartz minerals, it creates a very dramatic effect to the entire room.